Dagmara Genda’s work is massive yet intimate, Soviet and American, insistently flat with a resonance achieved through technical ingenuity and a startling story-telling force. 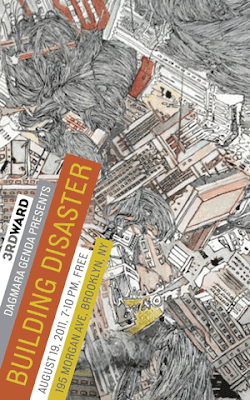 Come celebrate the first NYC show of Dagmara Genda, the winner of the 3rd Ward Winter Open Call. Born in Communist Poland and a self-described nomad of Canada, Genda creates consuming cityscapes that tell of blunt, brutal histories with an uncommon delicacy. Building Disaster will feature a large-scale, site-specific installation made of intricate hand-cut glossy vinyl that will take over an entire hallway in 3rd Ward. Other works are achieved through repeatedly layering rounds of wallpaper-like painting and drawing. Both painstaking methodologies confuse spatial relationships and create a visual tension with texture and a weighty world turned upside-down. By juxtaposing poverty and opulence, destruction and elegance, Genda has created a cacophonous riot that thrills. Featuring DJs, live accordion music from Matt Dallow, and complimentary drinks and pickles from Spear's Spears.